A postcard of the Martha Washington in 1904. 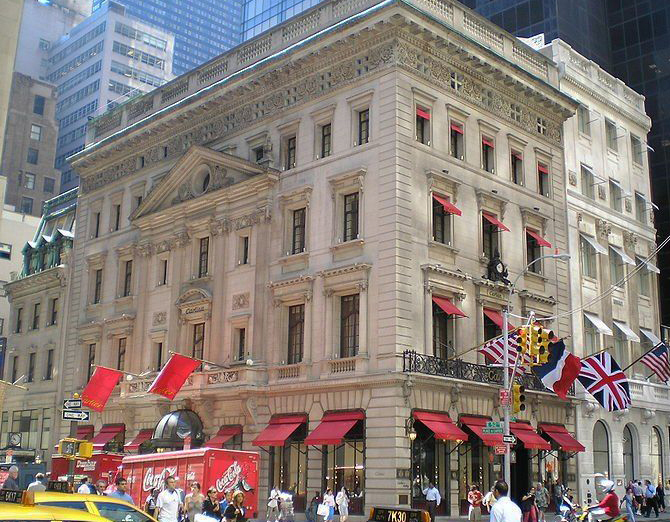 The Redbury Hotel opened as the Martha Washington Hotel on March 2, 1903 at 29 East 29th Street and was the first hotel built in New York to provide housing for professional women. Astoundingly, no man was to stay at the hotel until 1998, 95 years after the opening. In 1903, the centennial of America’s Independence was in recent memory, and there were “Martha Washington” balls each season. At the time, “Martha Washington” was also used in the names of countless women’s groups and DAR chapters, and many fashionable women were given “Martha Washington” as their first and middle names. It is easy to see why the first hotel exclusively for women would be named after the first First Lady. At the beginning of the 20th Century, mores and social conventions were changing quickly and the number of women on the work rolls was swelling. “Between 1870 and 1902, the number of women in the workforce increased by almost 64%.” 2 However, there were few housing alternatives open to these newly independent women. Indeed, it was difficult for a woman to check into a hotel when traveling alone and impossible after certain hours. Long-term residences were either very expensive, provided rudimentary services, or oppressed women with extensive regulations. The city needed an alternative where women would be treated equally. It was in response to these conditions that the Martha Washington was built by the Women’s Hotel Company, a for-profit corporation promising a 5% profit. The company sold shares not only to businessmen like John D. Rockefeller, and people of wealth, like John Gould’s daughter Helen, but also to bookkeepers, stenographers and other self-supporting professional women. 3 All of these people knew that the Martha Washington would be a tremendous stepping stone in women’s equality, but even they had no idea that it would become the headquarters of the suffragette movement in the United States. The hotel opened with 500 permanent guest apartments and accommodations for 150 transient guests. (There is some variance in the reported number of guests that could be accommodated in the hotel on opening. We have used the numbers reported by The Times on February 3, 1903.) 4 The land and building cost $800,000 and rooms ranged from $3 to $17 a week, all a far cry from today’s prices. In 1932, Arthur Gutterman distilled the wholesomeness promised by the hotel in his poem that appeared in The New Yorker. In naughty, red electric lights. Of lamps white and pure. 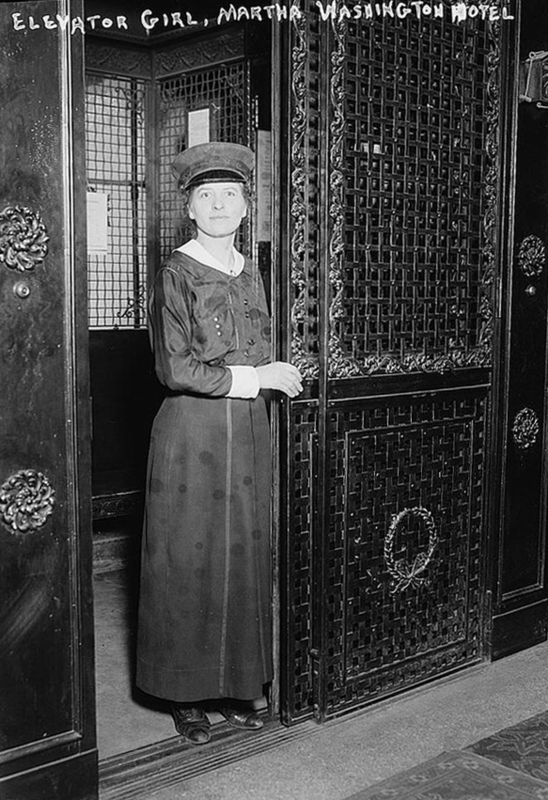 An elevator girl at the Martha Washington. When the Martha Washington opened, it had an unusual range of amenities that were described in one of its original brochures, including a drug store, ladies’ tailor shop, millinery store, manicurist, chiropodist, ladies’ shoe polishing parlor, and a newspaper stand. 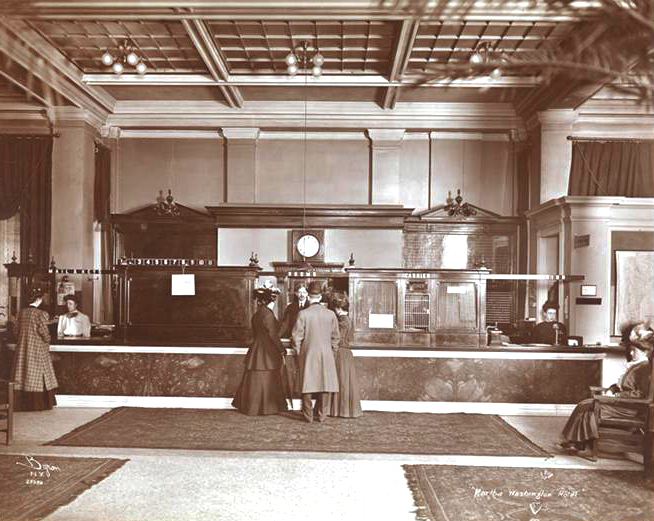 The lobby of the Martha Washington, a hundred years before it became The Redbury. For more of the The Redbury’s fascinating history, see Part 2, Part 3, Part 4 and Part 5 of our series. The New Yorker, April 2, 1932, Page 44. Margaret Gibbons Wilson, The American Woman in Transition: The Global Influence, 1870-1920, Westport, CT, Greenwood Press, 1979, Page 7. 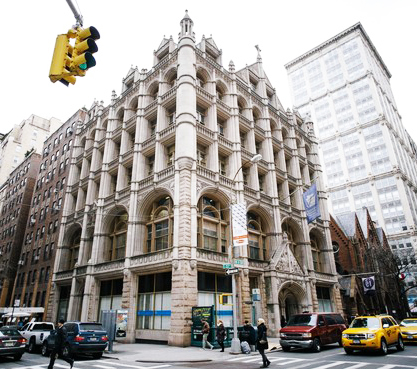 Report of the Landmarks Preservation Committee on the Martha Washington Hotel, June 12, 2012 [http://www.nyc.gov/html/lpc/downloads/pdf/reports/2428.pdf], Page 5. The New York Times, “Hotel for Women Only,” February 3, 1903. 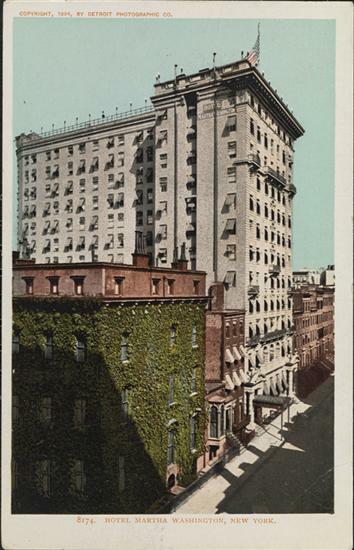 Turkel, Stanley, Built to Last: 100+ Year-old Hotels in New York, AuthorHouse, Bloomington, Indiana, 2011. Report of the Landmarks Preservation Committee on the Martha Washington Hotel, June 12, 2012 [http://www.nyc.gov/html/lpc/downloads/pdf/reports/2428.pdf], Page 6.